For other people named William Lynn, see William Lynn (disambiguation). William J. Lynn III (born January 1, 1954) is a former United States Deputy Secretary of Defense. Before that he was Under Secretary of Defense (Comptroller) and a lobbyist for Raytheon. Lynn graduated from Dartmouth College in 1976, and later studied at Cornell Law School to receive his law degree in 1980 and graduated from the Woodrow Wilson School at Princeton University in 1982 with an M.A. in public affairs. After this he was employed by the Center for Strategic and International Studies, where he was the executive director of the Defense Organization Project from 1982 to 1985. That last year he published the book Toward a More Effective Defense. At some point in time he was a senior fellow studying strategic nuclear forces and arms control at the National Defense University's Strategic Concepts Development Center, and went on to be the legislative counsel for defense and arms control matters for Massachusetts Senator Edward Kennedy between 1987 and 1993. During this time he also worked as Kennedy's staff representative on the Committee on Armed Services. Lynn later worked as an assistant to the Secretary of Defense for Budget, and in April 1993 joined the office of the Secretary of Defense (then Les Aspin) to be director for program analysis and evaluation. On October 21, 1997, President Bill Clinton nominated Lynn to be Under Secretary of Defense (Comptroller), and after a Senate confirmation on November 13, he was sworn in on November 19. After leaving at the end of the Clinton Presidency, Lynn became the executive vice president of the management consulting firm DFI International in 2001, but left in August 2002 when he was hired by the Raytheon Company, where he held the title senior vice president of Government Operations and Strategy. 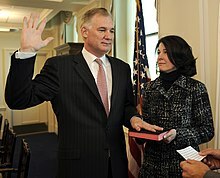 Lynn being sworn in as Deputy Secretary of Defense, accompanied by his wife. On January 8, 2009, President-elect Barack Obama nominated Lynn as his Deputy Secretary of Defense. This was complicated by the fact that new ethic rules promulgated by Obama for members of his administration created a waiting period of two years between lobbying activities and working for the administration on the same issues, which Lynn's work with Raytheon violated. President Obama waived the new rules for Lynn, which received criticism from John McCain as well as outside groups such as the Project on Government Oversight, Citizens for Responsibility and Ethics in Washington, Government Accountability Project, and Public Citizen. McCain later said that the nomination should probably move forward. As nominee, Lynn agreed to sell his holdings of Raytheon stock. Lynn's appointment was approved by the U.S. Senate Armed Services Committee on February 5, 2009 by unanimous consent. On February 11, 2009, Lynn was confirmed in the full Senate by a vote of 93–4. He took the oath of office on February 12. Lynn cautioned in May 2009 that Congress and the Obama administration should be careful not to make things worse in overhauling the Pentagon's weapons-buying practices. "We need to keep in mind the importance of not making the system worse in our efforts to achieve reform," Lynn said in testimony prepared for the House Armed Services Committee. "This has happened in the past." Lynn told lawmakers the Pentagon will hire 20,000 new personnel to manage weapons acquisition as part of sweeping reforms that President Obama and Congress have been pushing for. The proposal to hire 20,000 new employees is "aggressive," Lynn said, but the Pentagon needs program managers, cost estimators, software engineers and systems engineers. He said Pentagon leadership will start bringing the new people in at the beginning of fiscal 2010. "We are mindful it is going to be an organizational challenge," he said. Lynn touring Marine positions in Afghanistan. Lynn warned that in order to get to the $100 billion in savings the Pentagon leadership and the military services will have to identify "lower priority programs" that are not going to be part of future budgets. On January 6, 2011, Secretary of Defense Robert Gates outlined the $100 bn worth of savings planned over the next 5 fiscal years (FY2012-FY2016) designed to be reinvested in military capabilities, plus additional 5-year savings worth $78 bn designed to contribute to deficit reduction. These include, among other things, the consolidation of numbered air force staff, the disestablishment of JFCOM and the Second Fleet, Air Mobility Command fuel savings, multi-year procurement policies, and cancellations of hundreds of report requirements (many of them dating back to the 1950s). In May 2011 Lynn indicated that the department is moving to balance how much it invests in counterinsurgency versus more traditional military capabilities. "I think you can decide which of those two you want to emphasize," said William Lynn. "I don't think you can eliminate either. I don't think that's possible." Lynn said the wars in Iraq and Afghanistan have been more difficult than had been expected, but the U.S. military must have enough troops and the right kind of training, equipment and family support for future long conflicts, which he said are still "plausible." In July Lynn announced that he would leave DoD. "Bill Lynn has provided outstanding advice and counsel to this department and to the nation over the course of his long career," Leon Panetta said in a statement released on 7 July. "I will rely on his experience and expertise during this transition period. His service will be greatly missed." He left his office on October 5, 2011. On January 26, 2012 DRS Technologies announced Lynn's selection to lead Finmeccanica's efforts in the U.S. and as such has been elected Chairman of the Board and Chief Executive Officer of DRS Technologies. ^ a b c d e f "WILLIAM LYNN SWORN IN AS DOD COMPTROLLER". U.S. Department of Defense. 1997-11-19. Retrieved 2009-01-25. ^ "Toward a more effective defense : report of the Defense Organization Project". Library of Congress. Retrieved 2009-01-25. ^ Rucker, Philip (2009-01-08). "Obama Names Deputy Defense Secretary, Top Pentagon Officials". Washington Post. ^ Kravitz, Derek (2009-01-23). "Obama Nominee Runs Into New Lobby Rules". Washington Post. Retrieved 2009-01-25. ^ Dimascio, Jen (2009-01-23). "Lynn's appointment still not settled". Politico. Retrieved 2009-01-25. ^ Dimascio, Jen (2009-01-25). "Lynn uniquely qualified for new role". Politico. Retrieved 2009-01-26. ^ "Pentagon nominee agrees to sell Raytheon stock". Associated Press. International Herald Tribune. 2009-01-24. Retrieved 2009-01-25. ^ Levine, Adam (2009-02-05). "Senate committee approves controversial lobbyist". CNN. Retrieved 2009-02-06. ^ "U.S. Senate Roll Call Votes 111th Congress - 1st Session". United States Senate. 2009-02-11. Retrieved 2009-02-11. Wikimedia Commons has media related to William J. Lynn III. "Biography of William J. Lynn, III". United States Department of Defense. This page was last edited on 8 April 2019, at 21:53 (UTC).